Probably the most potent show of the tour so far, highlighted by a guest shot on "Beast of Burden" by local hero Juanes, but one I would rather forget. It was hard to get in the mood after pickpockets stalked the entry gates. I had to fight to get my wallet back after a diligent chap twice opened the concealed cargo pant zipper on my Prana pants. I grabbed and yelled him at him, he tossed the wallet away, and some people saved it for me. Others were not so lucky, losing cash, wallets and phones. It seemed everyone in the lounge had a story to tell, and the night was ruined before it even started for some very good folks. I spent much of the show in a state of paranoia, and just wanted it to end so I could rush back to the hotel and check on my bag. Mick, on the other hand, was in an excellent mood. He playfully pushed Ronnie at one point, and later grabbed the cigarette from his mouth during Ronnie's "Dead Flowers" solo. He also said (I think) that Ronnie drank eight cups of Colombian coffee, boosting the economy. And he joked about the Museo Botero, with a cascade of well-received punchlines that I didn't understand. After Darryl's bass solo, "Mick asked, Is that it?" The were a couple of nice moments with Keith as well. 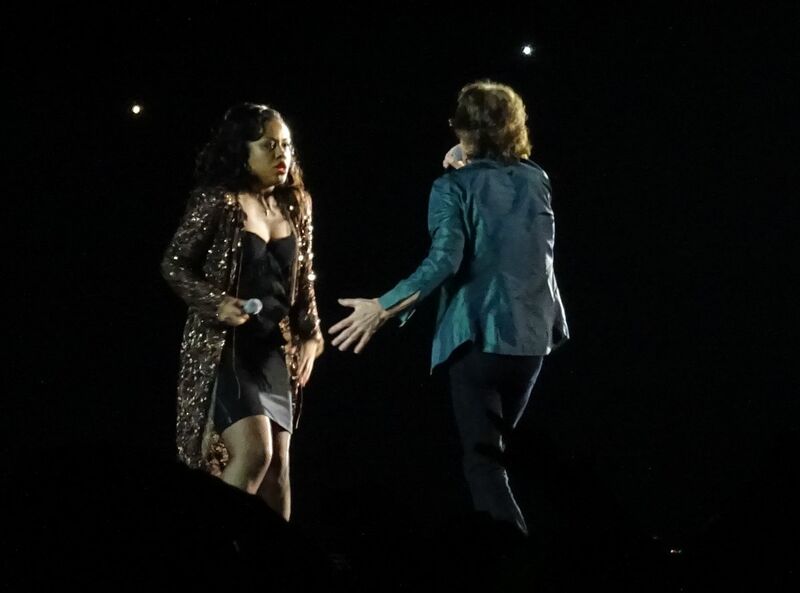 Maybe Mick had met a Colombian beauty, or was doing the math on all the US$400 tickets sold in the first half of the floor. That was another thing. The place was packed, and views severely restricted. I managed to get a place parallel with the end of the catwalk, but spent most of the show watching the screen. The audience on the floor enthusiastically captured digital memories of the historic night. Whether anyone watched the show the old-fashioned way is another matter. Keith's performance was spotty. It took him several attempts to get "It's Only Rock' n' Roll" started. For a scary moment I thought he was having a major health issue. 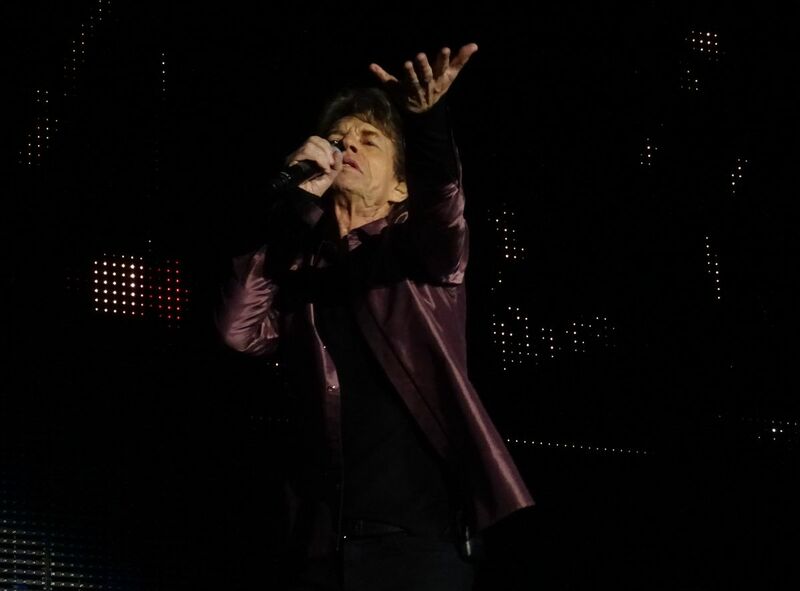 "Gimme Shelter" also got off to a shaky start. He really shouldn't lead into "You Got The Silver" by saying, "Tonight, let's rock it up." And he played the opening riff of "Brown Sugar" when it should have been "Start Me Up," prompting Mick to give him a clue: "The other one." Still, he seemed to be having fun, and played pretty decisively at other points, and was chatty at others, giving a shout-out to the "señoritas," and introducing his second song thusly: "Before they run me out of here, this one's called Before They Make Me Run." He growled a bit during the song, which was a nice touch. I knew "Dead Flowers" would be the Internet choice over the superior alternatives. Oh well. But I started getting into it about halfway through. I wonder if the vote should be restricted to ticket buyers via a unique code on their tickets to improve the chances of the vote going my way. Juanes was great. "Beast of Burden" is a good duet song, reminding me of the decent job that Ed Sheeran did last year. Juanes was totally at home on stage, and Keith was beaming at him for the whole song. A third guitar is always a thrill, and a reminder of how Mick Taylor is missed. It also saved us from Mick and Bernard's awkward Sam and Dave joust during the outro. The show started early just after 8:30 pm, was done by 10:40, and I was back in my hotel room within 15 minutes. After the pickpockets and Juanes, that may be my strongest memory. OK just got back from the show. My hotel is only 10 mins. away from the stadium, and it shouldn’t take any longer to get there, unless the Stones are doing a show, it’s rush hour and it’s raining buckets. The cab driver picked me up at 5 pm and we ended arriving at El Campín about an hour later. Went to the VIP area and guess who I met among the guests, the Eagles of Death Metal! All band members were there, they’re in South America as part of the Lollapalooza tour. We had a nice chat, mostly about music and (eventually) that infamous concert in Paris with the terrorist attacks. Small world, isn’t it? 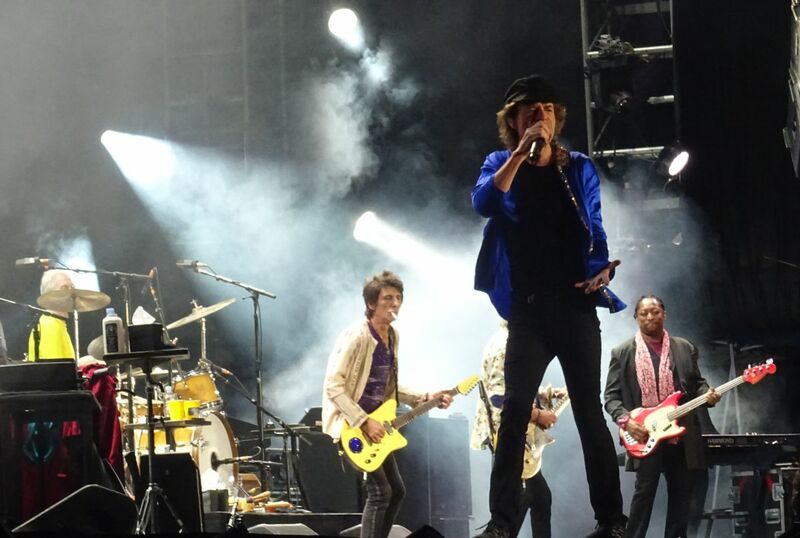 The Stones hit the stage half an hour earlier this time, at 8.30. 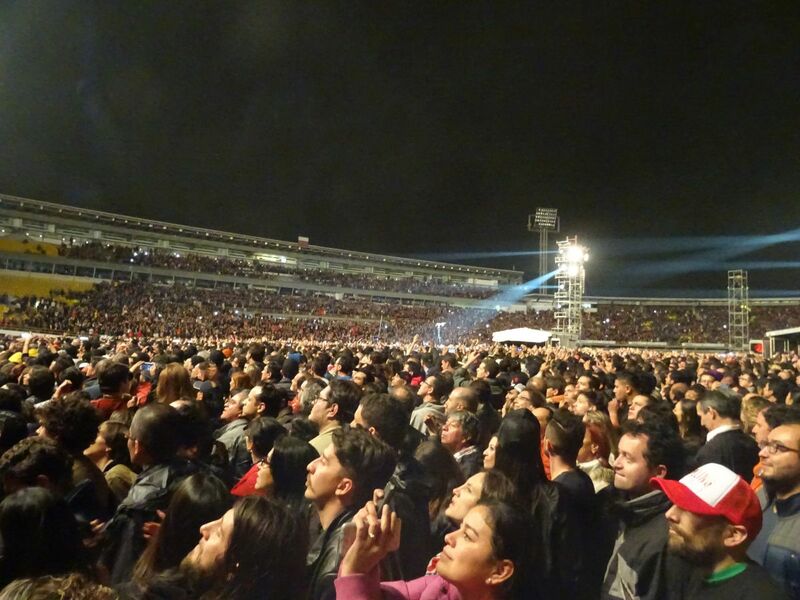 The stadium was almost full and the Colombian audience were quite impatient while getting ready for their first Stones’ concert ever in the country. First surprise came with the band not doing Out of Control, which has been played all through the earlier shows, Second one was the ‘request’ song with Dead Flowers, which sounded way too polished for my taste, however still quite nice to hear. 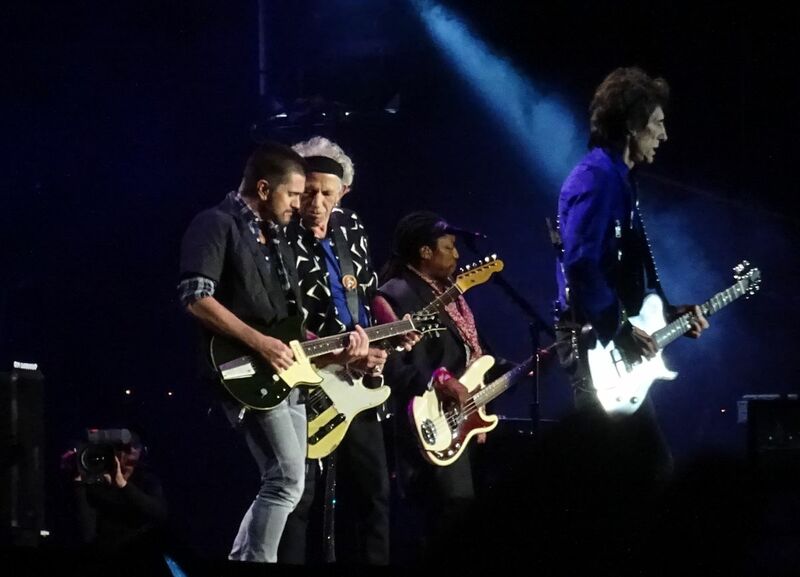 Third surprise was when Mick announced a special guest to join the Stones onstage (now that was new! ), and there came local pop star Juanes for Beast of Burden, which the audience may like (I still have to ask that to the locals), but who I consider a bad choice (blame it on Sir Mick!) Juanes may have won many Grammys and be as big as he is, but come on no way Sir! I would have preferred Carlos Vives instead, but you know how things like these are. And then came the usual ever-present setlist. Fortunately the rain had stopped before the start of the concert, eventually it got a bit cold. As for the band, Keith screwed up many times through the show (is it me or he looked too tired? 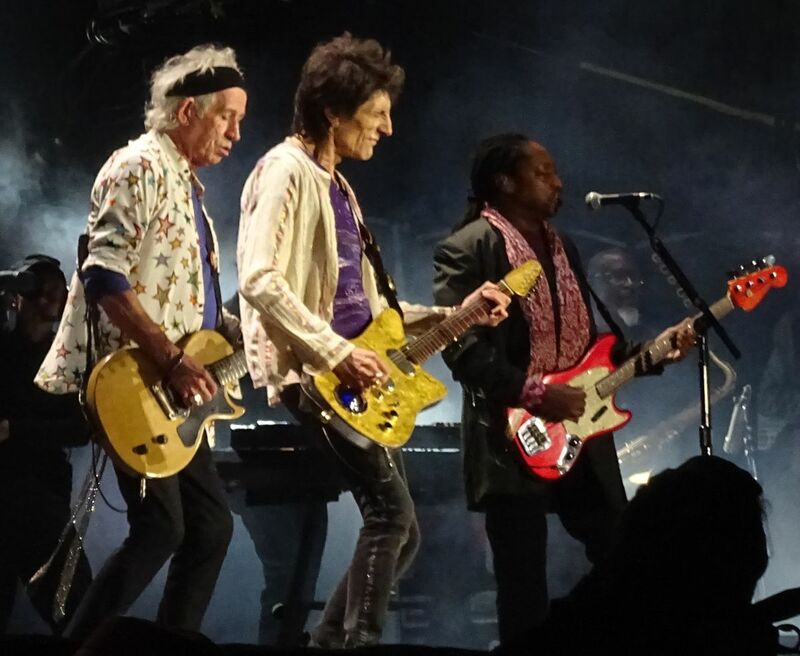 ), he even played the intro of Brown Sugar during Start Me Up, and Mick didn’t hesitate to point out it was “the other one” Also Ronnie’s guitar was way too loud. Add to that the sound was quite bad overall, you just walked around the stadium and it didn’t sound good anywhere. You can’t always get what you want, now can you? However I loved the Colombian audience, which sang, danced and shouted a lot (good for them!) 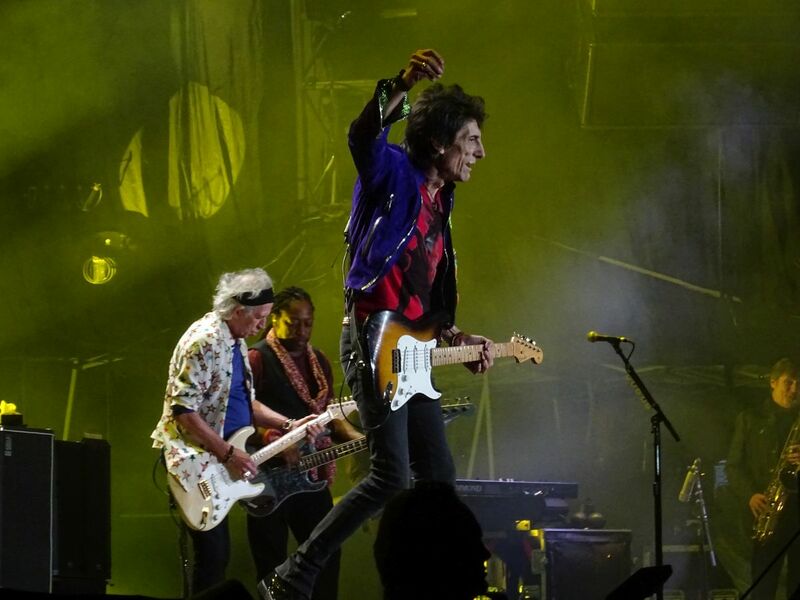 Funniest part was during the band intros, when Mick referred to the Stones (in Spanish) as “a group that contributed a lot to the Colombian economy through the years. Ronnie has at least 8 cups of coffee every day” Summing it up, save for the sound problems (and Keith many-a-screw-up), it was a great night, and I raise my glass for the Colombians, you truly deserved to see the show you’ve been waiting for so long! Next stop is, errrr, home. Yes this was my last show of the tour and I’m coming back home. It was a great trip (which went on for almost 32 days, 7 cities in 5 countries, getting to meet many dear friends from all over the world, plus the new ones, new cultures and places, I had the time of my life, so many stories! As usual, thank you for being there. See you around! I had settled in here in Bogota at a hotel in the socalled Finance area, a nice area with bouquet bars and restaurants. Having a meal at 4pm, I had to stay inside, because it was a heavy thunderstorm. As I was watching the lighting strike just outside my restaurant widow panorame view, I counted half a second between the lighting strike and the thunders, which means approx 150 meters, i.e. 500 feet. Pretty close. I also understood why the sidewalks in Bogota are so elevated, the streets were flooded by water like 15 cm high i.e. half a foot, never seen anything like it before. I walked the 3,2 km i.e. two miles to the Estadio el Campin as soon as the bad weather was over around 6pm. With an axpected show start early at 8:30pm, I should have plenty of time. I was at the stadium half an hour later, then adding half an hour messing around, no gates marked, chaos everywhere. All the people in charge pointed me in the wrong, direction, but my gut feeling and experience took me through the right gate around 7pm. Show start 8:30. The crowd is comfortable and nice, no pushing around. 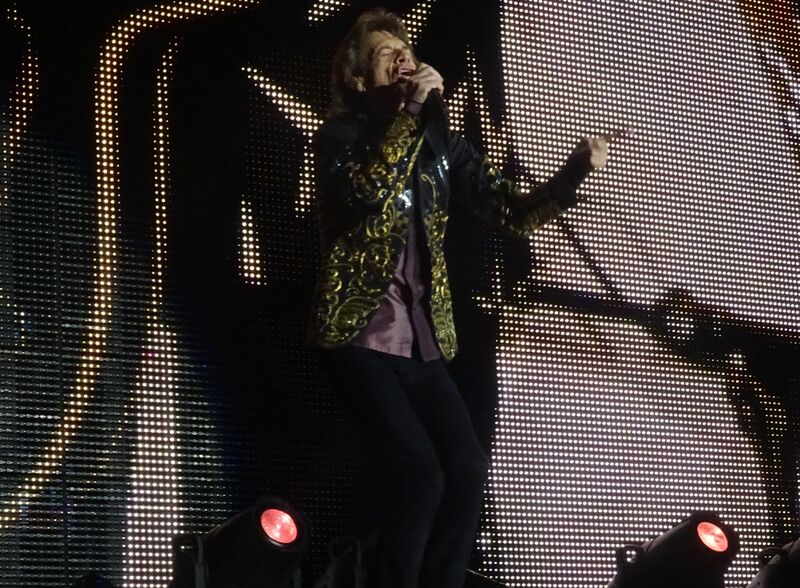 For a first time in history crowd; The Stones have never played Bogota, I was surprised they knew the songs and they were singing along. Tons of mobile phones in the air, also many selfie sticks, I bet the batteries went hot and they have many great memories from the show now. It is not often they can see the Stones here. 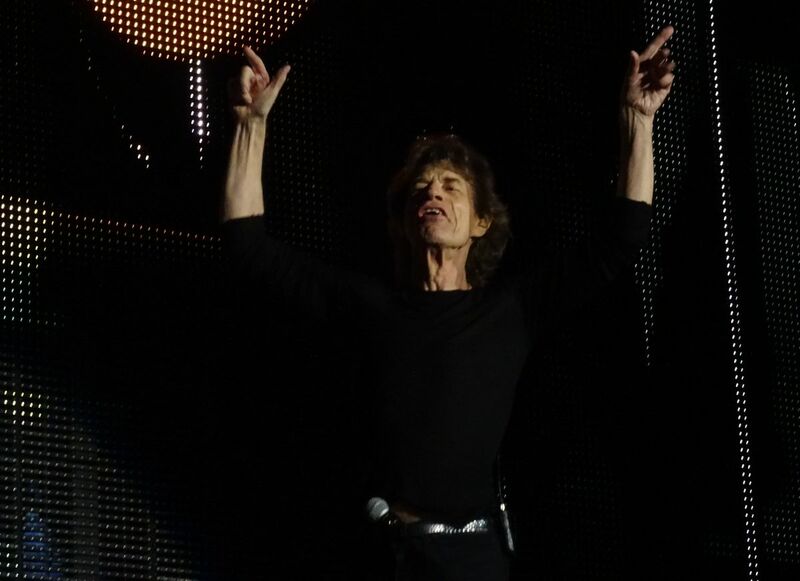 After "Tumbling Dice" everybody started to sing "Olé Olé Olé..." Great crowd, and Mick let the crowd sing out the emotions for a while. Then a row of three slow songs. First out the request song "Dead Flowers". Then a bunch of press protographers, a dozen or so, were brought back in. It never happens, the photographers are there for the first songs only. But we were on for something special. 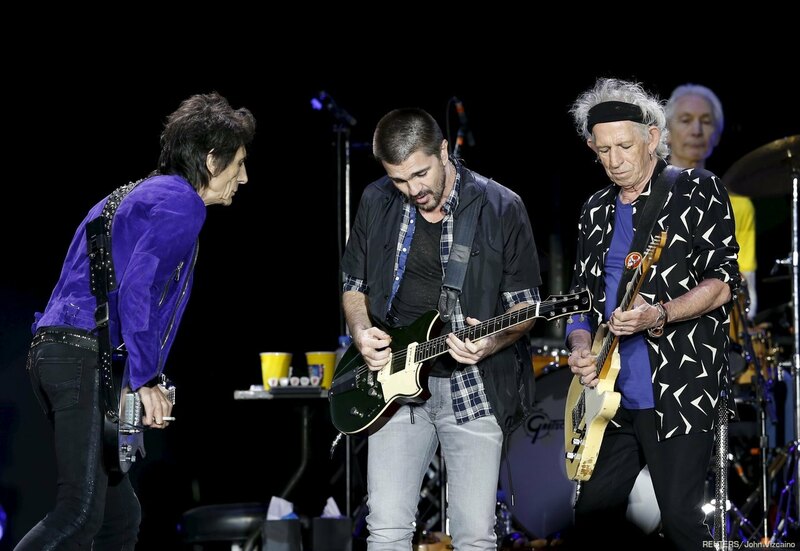 They brought on big star Juanes as a guest on guitar and vocals for "Beast Of Burden". This song is great with a guest spot. I just wonder if they are working on a set list for the show in Cuba. Juanes did the much talked about "Peace Without Borders" 2009 Peace Concert in Cuba. The third slow song at this show "Wild Horses", and the lack of "Out Of Control", I am sure they had in mind the high altitude of Bogota at 2,640 m (8,660 ft) for the set list tonight. During "Honky Tonk Women" five or six security people carried out a fan who obviously did not fit into the crowd. My salute to the security that we take for granted. 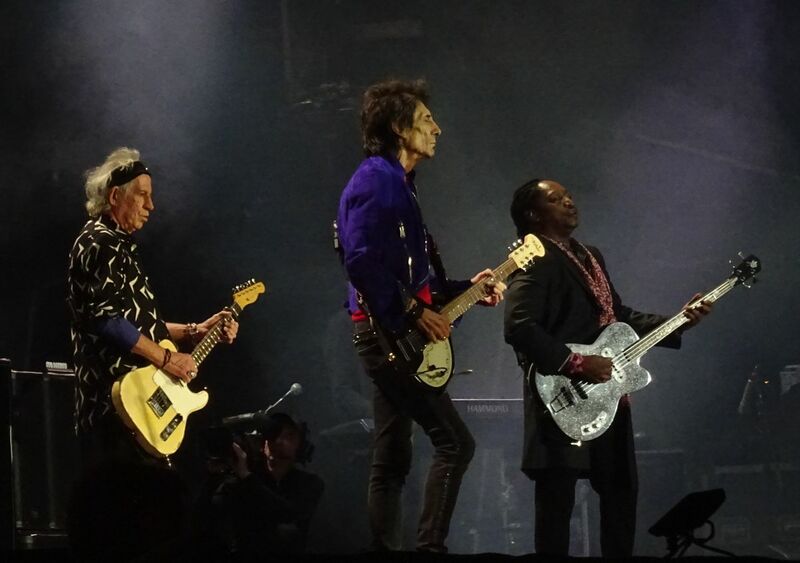 I noticed that the Stones personal security made sure the problem was solved with 100% satisfaction. Security is lots of hard work. Thanks to everyone in the organization who makes these show happen with a minimum of hazzle and a maximum of pleasure! 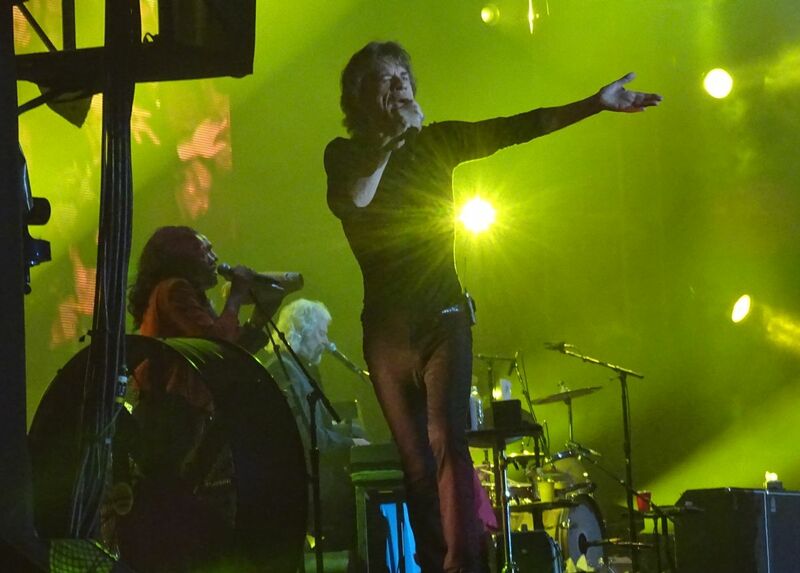 "Midnight Rambler" - Ronnie way out towards the B-stage on his solo, a new great version at every show. "Miss You" - Darryl is doing an extended bass solo, Mick out there with Darryl, and with a smile Mick says "is that it?" as Darryl finish his solo. And after "Miss You" more "Olé Olé Olé..." This is South America! 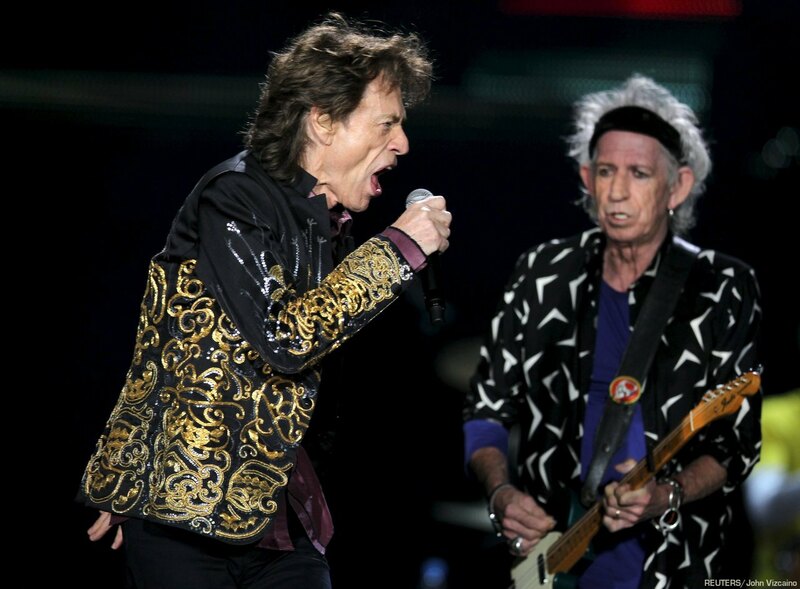 "Sympathy For The Devil" - Mick's voice so powerful. Deep, strong, nailing me to the stadium floor, and then Keith comes over to do his solo, the photo I chose as the key picture from this show. Keith has been strong all through this tour. "You Can't Always Get What You Want" - The Bogota crowd is singing like they use to sing this song at shows every night. 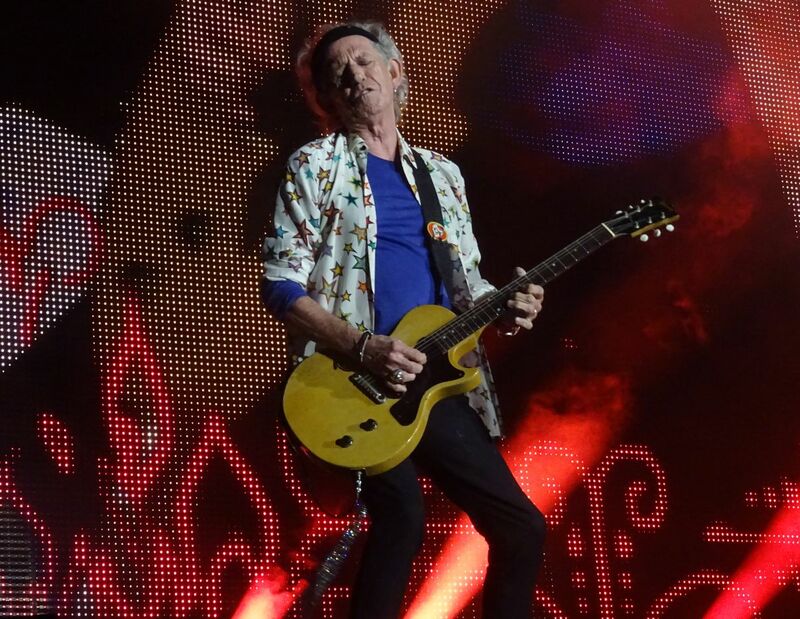 And then "Satisfaction", it is all over, another strong show here in South America, sadly the last one. 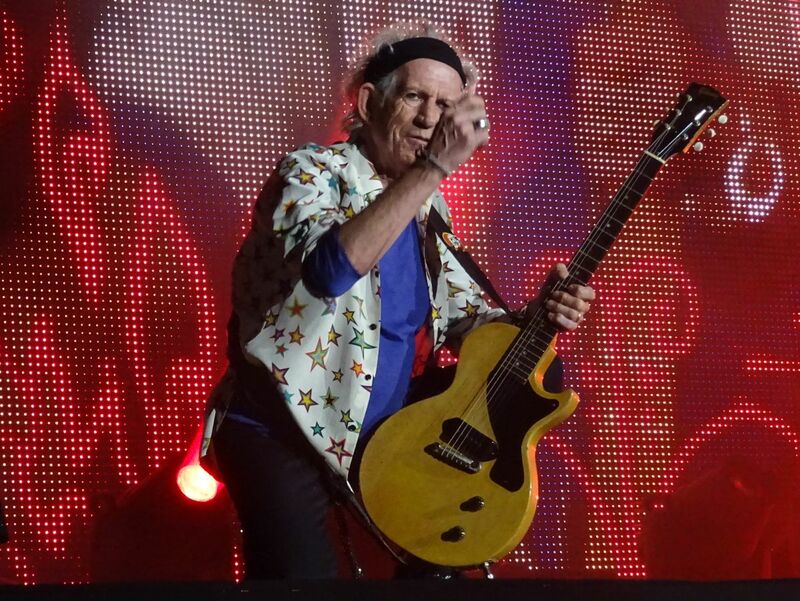 It has been six great weeks with The Rolling Stones in South America. A memory for lifetime. A historic tour visiting new cities, new countries, new fans. Thanks for all the great memories! 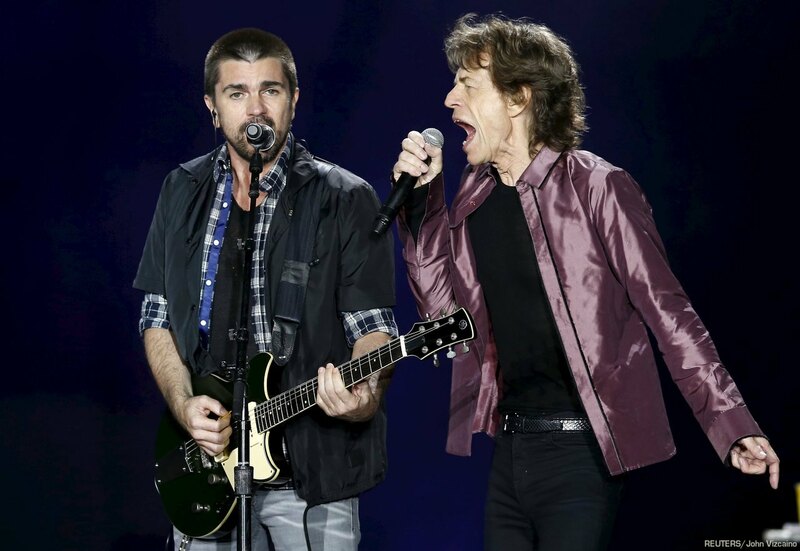 The choir was contacted 6 months before and Mick Jagger himself called Juanes. "Can I tell my mother?" asked one of the members of the main choir from the musical studies program at the Javeriana University when they were announced that they would audition for the Rolling Stones and when they were told to sign confidentiality clauses. It was October 2015 and the visit of the British band was still a rumor, but the technical team of the group was already looking for talented singers to perform 'You can not always get what you want' in the Bogota concert. 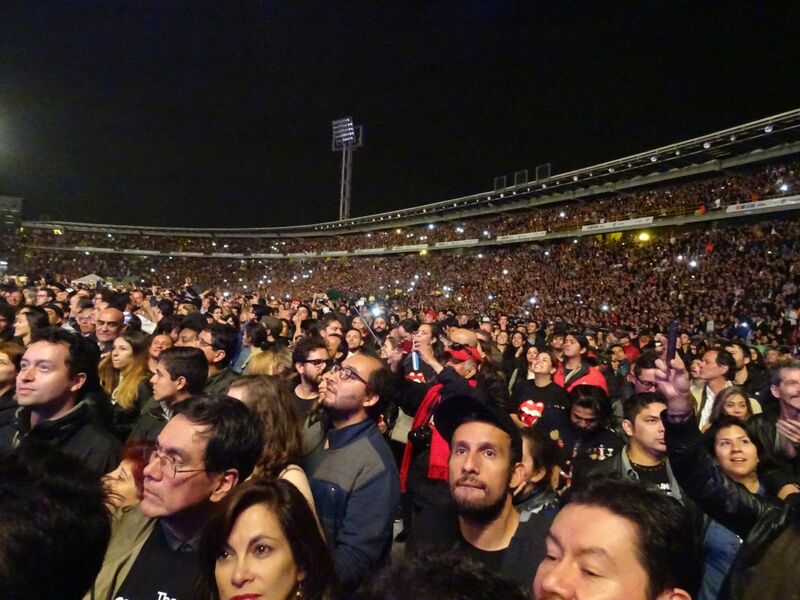 The bond was Professor Juan Antonio Cuellar, former director of the Batuta Foundation; and the choirs of Mexico contacted him (See also: The night that 45,000 people stick the tongue out with Rolling Stones). This way, the 25 best voices of the choir, under the direction of Ana Paulina Alvarez, took part of the greatest rock concert in the country's history, which also had an additional surprise: Juanes and the Stones performing 'Beast of Burden'. This hadn’t happened in the Olé tour. Alvarez, for whom one of the challenges was to keep the secret, said that the intensive rehearsal song for the audition was enough to convince the production that they were the indicated. And the day of the concert, in the rain, both the band and the choir gathered in a small room of El Campin. "We were in a family atmosphere, and after we started singing, Mick Jagger took the phone and began to record us, it was unique," said Alvarez. Then the choristers had another challenge: to teach Mick Jagger how to pronounce "Javeriana". 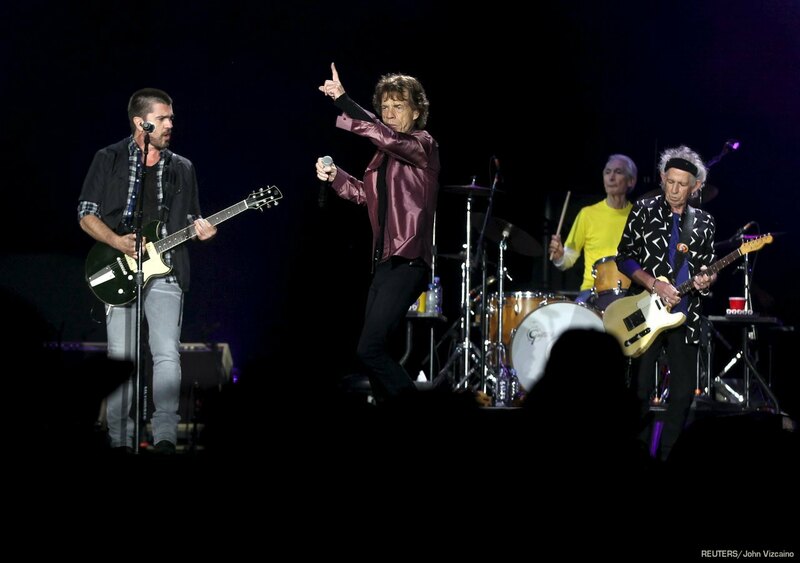 Juanes and the Rolling Stones didn’t know personally, but the British were the ones who invited the paisa. "I had received the request since January; we knew they wanted him to be there, but everything was resolved until Monday. Mick Jagger called Juanes and they talked about it, it was very cool (...), “the hardest part was to contain us to not tell anybody " recalled Rebeca Leon, the manager of Antioquia. "I know that for Juanes it was an extremely nice experience, not only for sharing the stage with them, but for the way they treated him."